Oftentimes, when people quarrel, they’re not really debating what they claim they’re arguing about. In many instances, there are issues beneath the surface that are the actual source of the conflict, most of which are far removed from the problem at hand. These proxy disputes provide a buffer against the real issue coming out, either because we don’t recognize the true root of the disagreement or because we’re not ready to deal with it. 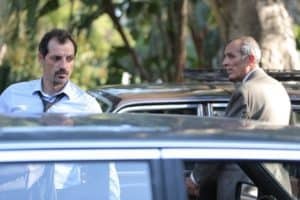 However, if true resolution is to come about, it’s imperative to cut through the clutter to get to the heart of the matter, an undertaking explored in the new Lebanese drama, “The Insult” (“L’insulte”) (web site, trailer). Not long thereafter, Talal encourages Yasser to give Toni what he wants. He informs Yasser that there’s more at stake than his pride, including future work. And so, Yasser reluctantly agrees to meet with Toni for a street-level summit organized by Talal. However, when the quarreling parties meet, Toni’s hatred becomes obvious, prompting Yasser to pull back from his promise to apologize. As the tension mounts, Toni lets loose with a racially charged disparagement of Yasser’s Palestinian heritage, an insult that could be seen as a hate crime. Toni’s words anger Yasser so much that he punches his opponent in the stomach, breaking several ribs and necessitating a hospital visit. The conflict lands the two men in court before a judge (Carlos Chahine) who has little patience for the combatants. When he asks each party for specific evidence, they either hedge their answers or refuse to divulge what they know, prompting him to dismiss the case and acquit Yasser. Unsatisfied, however, Toni presses on, appealing his case to a higher court and hiring one of the Christian community’s most prominent prosecutors, Wajdi Wehbe (Camille Salameh), to represent him. In turn, Yasser retains a young lawyer, Nadine Wehbe (Diamond Bou Abboud), who happens to be Wadji’s daughter, an idealist who strongly believes that Palestinian litigants don’t receive fair treatment in the Lebanese judicial system. Presiding over the case is a panel of three judges led by chief justice Collette Mansour (Julia Kassar), who intends to maintain a tight leash over proceedings that have the potential to get out of hand, especially now that the dispute has begun to receive increased public attention. Outside of court, circumstances quickly begin to spiral out of control. Issues arise involving the plaintiff’s health, which runs into complications during his recovery, and his relationship with his pregnant wife, Shirine (Rita Hayek), who subsequently develops serious obstetric challenges. On top of that, the case soon becomes a media circus, with racially charged sentiments spilling over into the streets, leading to protests, heated arguments and even riots, events that lead to innocent parties getting caught in the crossfire. Meanwhile, inside the courtroom, the ante is continually upped, especially when the parties’ counselors introduce evidence and conduct lines of questioning that delve into the litigants’ personal histories and backgrounds. Through these tactics, the real issues at the heart of their conflict emerge, most of which have causes that extend back far beyond a misunderstanding involving a drain pipe, some of which are rooted in the combating parties’ experiences in the Lebanese Civil War. With these issues exposed, painful memories surface, with anguish that becomes exacerbated when Toni and Yasser see what their skirmish is doing to their country, opening old wounds and threatening to make them worse. Quietly, each begins to reconsider their positions, but, publicly, even the heartfelt reconciliation pleas of a prominent politician (Rifaat Torbey) seem to go unheeded as the country descends into deeper and deeper chaos. Will Lebanon save itself before tearing itself apart? Will the quarreling parties get to the heart of their dispute and resolve it, setting an example for their increasingly contentious countrymen? Or is the nation’s fate irretrievably sealed, becoming yet another casualty of the uncontrolled emotional and political sentiments sweeping across so many countries these days? This is a potent cautionary tale with implications that can be writ both large and small, given that the bedrock on which they rest is the same in both cases – and just as shaky in each instance. 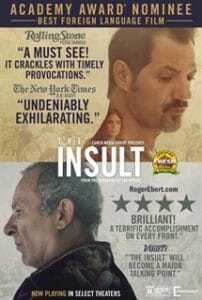 Though sometimes a little shrill and overly dogmatic in its tone and a little formulaic in its narrative format, “The Insult” nevertheless serves as an effective metaphor for what’s wrong with humanity these days. 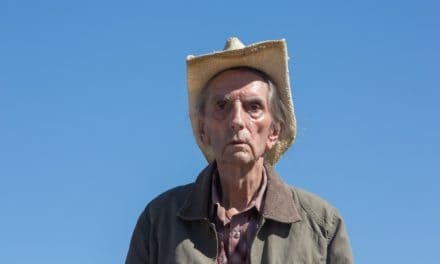 Excessive polarization, a desire for vengeance rather than justice and an unwillingness to compromise all take front-row seats in this drama about the sometimes-futile quest to find balance and reconciliation when those qualities are virtually nonexistent. A knowledge of Middle Eastern history and politics certainly helps aid the viewing experience of this film, but, even with not knowing all the details, the essence of the conflicts – and the picture’s central message – still come through loud and clear (sometimes a little more so than one might want). Yet, for its efforts, the picture has received an Oscar nomination for best foreign language film. As this film illustrates, it would be in our best interests to face up to what the real issues are in our lives, be it on a personal or national scale. To put it off only prolongs the pain and the length of the resolution process. But it’s not impossible. “The Insult” shows what it means to make the effort and to search for a solution – while we still have the chance. Can a good man truly lead without being corrupted by the power that comes with it? History is certainly replete with plenty of examples to the contrary, and, in an age where widespread greed and self-serving attitudes sometimes seem ubiquitous, the question takes on added significance. That’s why it’s so important to have role models who seek to live up to that ideal, an example of which provides a central theme in the new action-adventure, “Black Panther” (web site, trailer). 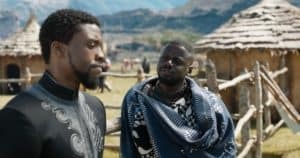 Young King T’Challa (Chadwick Boseman, left) and longtime confidante W’Kabi (Daniel Kaluuya, right) face multiple challenges to protect their mythical African homeland of Wakanda in the new action-adventure, “Black Panther.” Photo by Film Frame © Marvel Studios. In the latest offering from Marvel Studios, audiences witness the adventures of T’Challa (Chadwick Boseman), king of the mythical African nation of Wakanda, a technologically advanced society shrouded from the outside world, a kind of high-tech Shangri-La. When he unexpectedly assumes the throne after the untimely assassination of his father, T’Chaka (John Kani), the young monarch must grow up fast. But, as an idealistic leader, he willingly takes on the challenge, daunting though it may be. King T’Challa’s alter ego, the Black Panther (Chadwick Boseman), matches wits with an array of evildoers in the new action-adventure tale, “Black Panther.” Photo by Film Frame © Marvel Studios. These are questions that T’Challa doesn’t get much time to ponder, as outside forces soon force his hand. 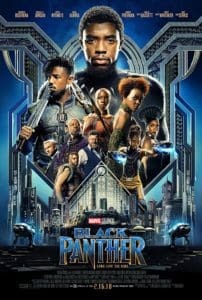 Nefarious foes, like arms dealer Ulysses Klaue (Andy Serkis) and former black ops soldier Erik “Killmonger” Stevens (Michael B. Jordan), seek to plunder and exploit Wakanda’s resources and use its technology to help an alliance of underprivileged countries rise up and assume power over the planet as a unified force. 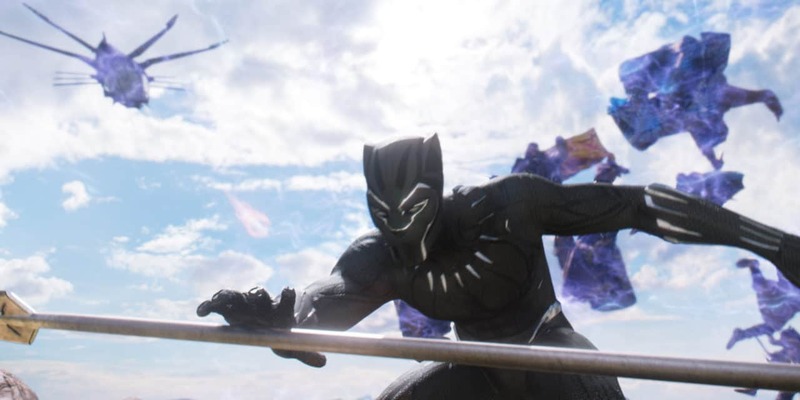 And the only one standing in their way is the noble monarch and his alter ego, the Black Panther, with aid and support from his onetime romantic interest, Nakia (Lupita Nyong’o), his loyal military aide, Okoye (Danai Gurira), his tech whiz sister, Shuri (Letitia Wright), his courageous, resourceful mother, Ramonda (Angela Bassett), and an old acquaintance, CIA agent Everett Ross (Martin Freeman). As events play out, complications develop, making the job of T’Challa/the Black Panther ever more difficult. The forces he takes on grow increasingly powerful, especially once they get their hands on the keys to the kingdom. He even has cause to question the loyalty of friends, such as his longtime confidante W’Kabi (Daniel Kaluuya). It’s also disheartening for T’Challa to discover that the roots of these current issues stem from mistakes made in the past by those near and dear to him, errors in judgment that harbored personal ill will, as well as the seeds of the kingdom’s present-day troubles. The young leader learns what it means to grow up and into one’s power more quickly than expected – and to tap into one’s own sense of right and wrong, not necessarily the lessons imparted to him during his grooming for the throne. His odyssey truly becomes one of finding out whether it’s indeed possible for a good man to rule justly and effectively. Former black ops soldier Erik “Killmonger” Stevens (Michael B. Jordan) seeks to plunder and exploit the resources of a nation in “Black Panther.” Photo by Film Frame © Marvel Studios. These sentiments, coupled with the inherently noble attributes typically accorded a superhero, provide the basis for the narrative in “Black Panther.” However, the film’s excessive earnestness and the protagonist’s nearly complete lack of any character flaws at times lead to a story that borders on implausibility. What’s more, as much as I’ve admired Boseman’s stellar performances in pictures like “Get on Up” (as soul singer James Brown, 2014) and “42” (as baseball great and civil rights activist Jackie Robinson, 2013), he seems miscast here, coming across as one of the blandest heroes I’ve ever seen on screen. In fact, when you find yourself more drawn to a villain like Jordan’s Killmonger, that speaks volumes about the ineffectiveness of the casting. 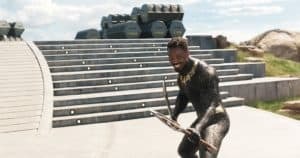 Of course, it probably doesn’t help that the protagonist and the rest of the cast have to work with a script full of cookie cutter predictability and an insufficient back story for T’Challa’s alter ego, not to mention an array of generally underwhelming special effects. 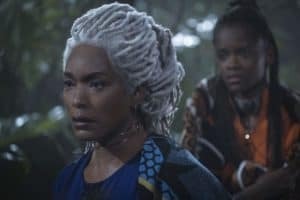 Ramonda (Angela Bassett, left), widow of an assassinated king, and her daughter, Shuri (Letitia Wright, right), seek to aid a new monarch in peril in “Black Panther.” Photo by Matt Kennedy © Marvel Studios. 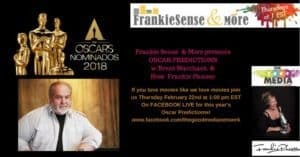 For those who may have missed my Oscar predictions show last week on Frankiesense & More with Frankie Picasso, you can catch the replay on demand on video by clicking here and on audio only by clicking here. 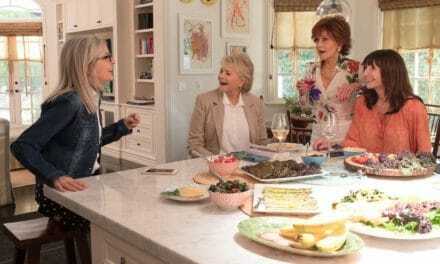 We discuss my predictions for winners in the top six categories, as well as reviews of some new releases available in theaters or for home viewing. 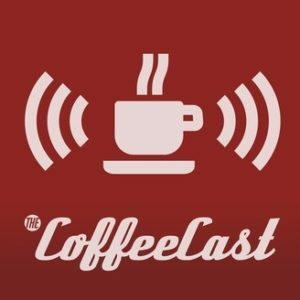 For an irreverent look at the Oscars and my predictions, tune in to the latest episode of TheCoffeeCast with host Tom Cheevers, available by clicking here. My longtime friend and media collaborator take an offbeat look at the annual competition, but be forewarned – explicit language included in this podcast! 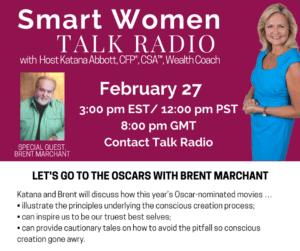 For a look at how some of the leading contenders at the Academy Awards reflect conscious creation principles, tune in to the latest episode of Smart Women Talk, available by clicking here. Join host Katana Abbott and me for an inspiring and entertaining hour of movie chat. 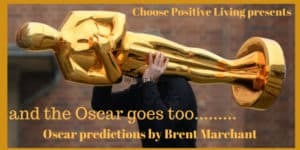 And, lastly, for a look at my picks for the best and worst films of 2017, along with my Oscar predictions, tune in for the latest edition of Choose Positive Living on Self Discovery Radio, available by clicking here. Join host Sara Troy and me as we take a look back at last year’s top and bottom releases, as well as who will likely take home hardware on Oscar night. And, while you’re at it, check out my web site and its blog entries for my Oscar predictions and my best and worst picks of 2017.